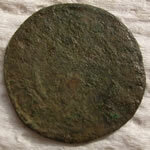 A rather common coin to find in the venecian area, I'm surprised you found it in Essex! Thanks again for the great info which I have uploaded to my site. We have a fair site we detect and the sailors from Harwich the port went there as we have found a lot of early Navy buttons. Are you English Rob ? Nice website, looks metal detecting looks like great fun! I'll send you a private message.